Download "45.241 Definitions -- State agencies and Court of Justice to develop inventory of each debt -- Liquidated debts of agency, Court of Justice, or local"
1 Definitions -- State agencies and Court of Justice to develop inventory of each debt -- Liquidated debts of agency, Court of Justice, or local government submitted to Department of Revenue -- Accounting of uncollected debt -- Treatment of collected debt -- Annual reports. 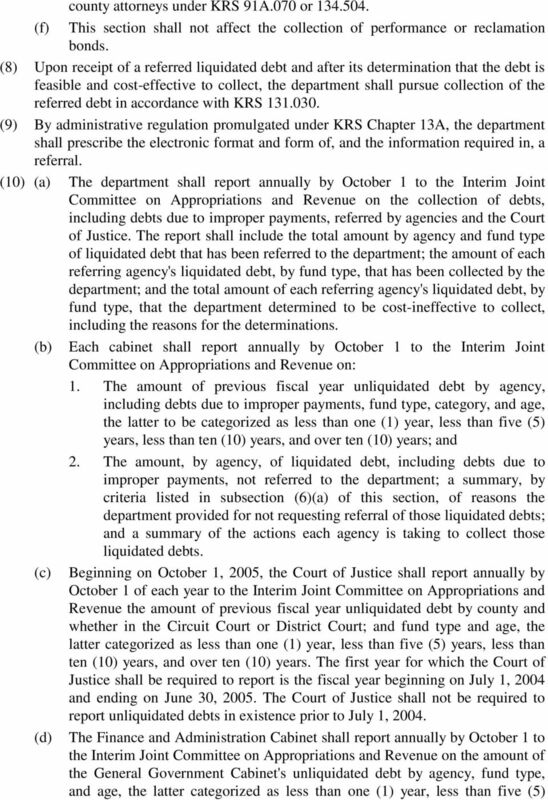 (1) As used in this section: (a) "Debt" means: 1. For agencies, a sum certain which has been certified by an agency as due and owing; and 2. For local governments, a sum certain which has been certified by a local government as due and owing, including but not limited to any delinquent taxes or fees other than delinquent real and personal property taxes; (b) "Liquidated debt" means: 1. For agencies, a legal debt for a sum certain which has been certified by an agency as final due and owing, all appeals and legal actions having been exhausted; 2. 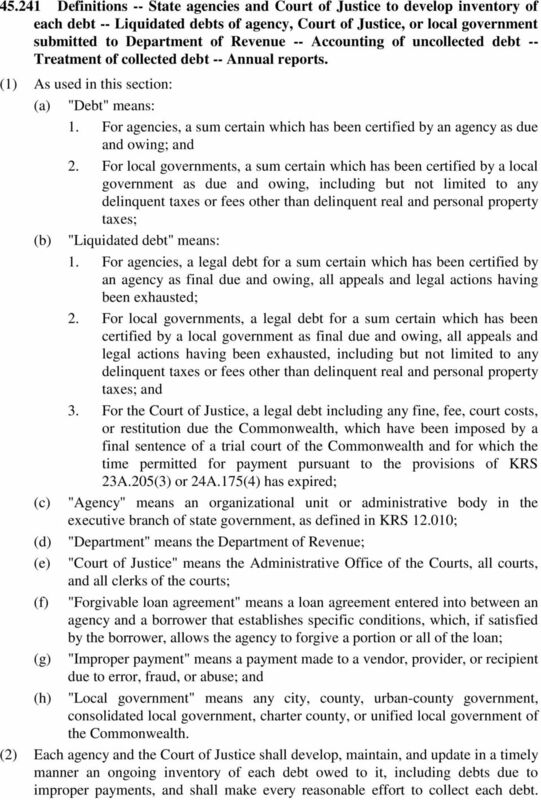 For local governments, a legal debt for a sum certain which has been certified by a local government as final due and owing, all appeals and legal actions having been exhausted, including but not limited to any delinquent taxes or fees other than delinquent real and personal property taxes; and 3. For the Court of Justice, a legal debt including any fine, fee, court costs, or restitution due the Commonwealth, which have been imposed by a final sentence of a trial court of the Commonwealth and for which the time permitted for payment pursuant to the provisions of KRS 23A.205(3) or 24A.175(4) has expired; (c) "Agency" means an organizational unit or administrative body in the executive branch of state government, as defined in KRS ; (d) "Department" means the Department of Revenue; (e) "Court of Justice" means the Administrative Office of the Courts, all courts, and all clerks of the courts; (f) "Forgivable loan agreement" means a loan agreement entered into between an agency and a borrower that establishes specific conditions, which, if satisfied by the borrower, allows the agency to forgive a portion or all of the loan; (g) "Improper payment" means a payment made to a vendor, provider, or recipient due to error, fraud, or abuse; and (h) "Local government" means any city, county, urban-county government, consolidated local government, charter county, or unified local government of the Commonwealth. (2) Each agency and the Court of Justice shall develop, maintain, and update in a timely manner an ongoing inventory of each debt owed to it, including debts due to improper payments, and shall make every reasonable effort to collect each debt. 5 years, less than ten (10) years, and over ten (10) years. 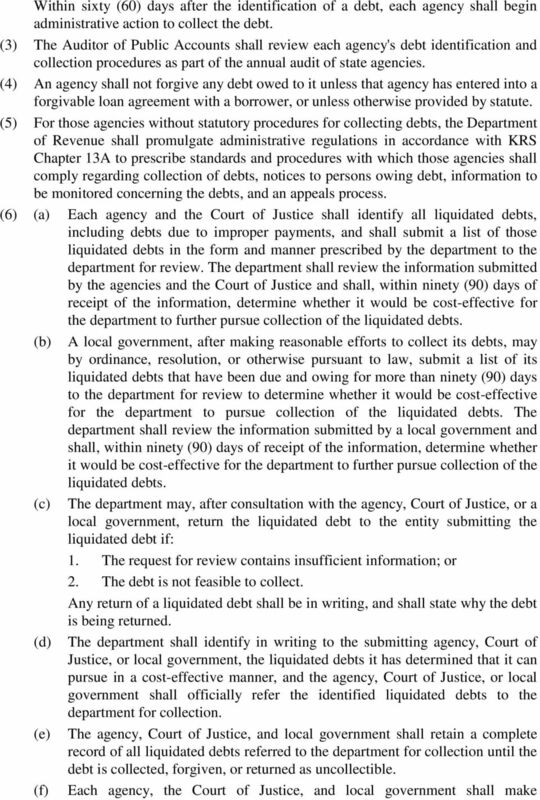 (11) At the time of submission of a liquidated debt to the department for review, the referring agency, the Court of Justice, or, where feasible, the local government shall provide information about the debt to the State Treasurer for the Treasurer's action under KRS (1). Effective: June 25, 2013 History: Amended 2013 Ky. Acts ch. 88, sec. 5, effective June 25, Amended 2009 Ky. Acts ch. 10, sec. 54, effective January 1, Amended 2008 Ky. Acts ch. 44, sec. 2, effective July 15, Amended 2005 Ky. Acts ch. 85, sec. 64, effective June 20, Created 2004 Ky. Acts ch. 118, sec. 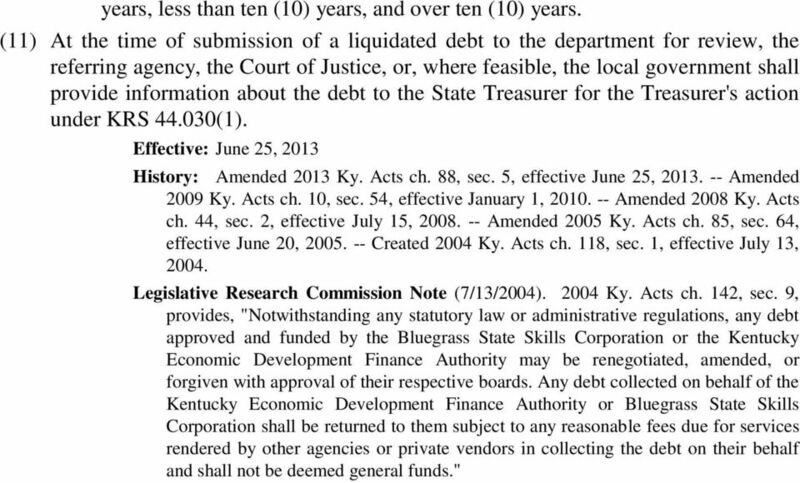 1, effective July 13, Legislative Research Commission Note (7/13/2004) Ky. Acts ch. 142, sec. 9, provides, "Notwithstanding any statutory law or administrative regulations, any debt approved and funded by the Bluegrass State Skills Corporation or the Kentucky Economic Development Finance Authority may be renegotiated, amended, or forgiven with approval of their respective boards. 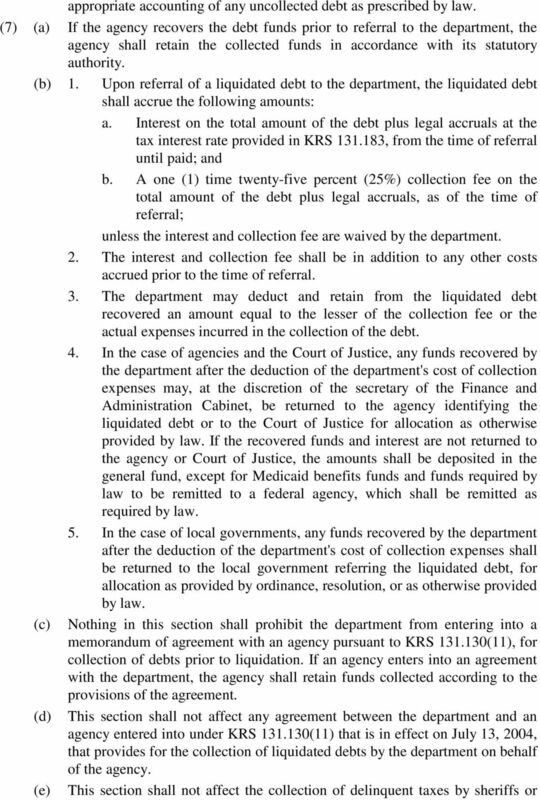 Any debt collected on behalf of the Kentucky Economic Development Finance Authority or Bluegrass State Skills Corporation shall be returned to them subject to any reasonable fees due for services rendered by other agencies or private vendors in collecting the debt on their behalf and shall not be deemed general funds." 61.702 Group hospital and medical insurance and managed care plan coverage -- Employee and employer contributions -- Minimum service requirements. BOSTON UNIVERSITY SCHOOL OF LAW LOAN REPAYMENT ASSISTANCE PROGRAM Program Description and Terms August 2014 Introduction Boston University School of Law has a strong tradition of commitment to public service.